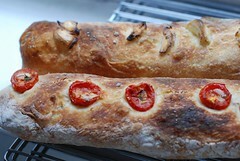 One of the regular “weekly columns” I’d like to start working on in 2011 is Sunday Suppers. The idea is that throughout the week, Alex and I will eat relatively healthy, but on Sundays I’d like to take some time to make a nice meal with a real dessert. It’ll be a chance for me to try new recipes, or make a lovely layer cake, or overdose on chocolate, or….you get the idea. The inaugural post came from the idea of using up the turkey stock from Christmas, and from me eyeing my copy of Jim Lahey’s My Bread every night on my bedside table. 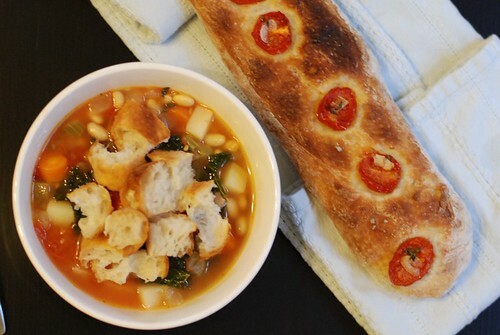 I decided to throw together a stecco with cherry tomatoes, and a ribollita soup with lots of veggies and canned beans to counteract all the indulgences we’ve had recently. 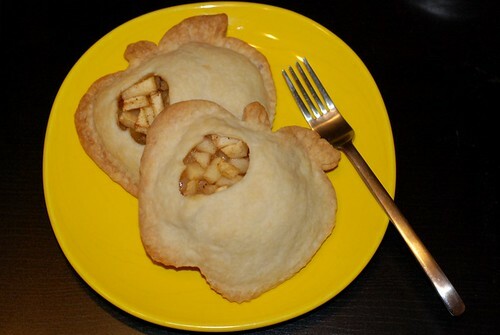 For dessert, I also took something new for a spin – my apple pie recipe in the Williams-Sonoma apple pie pocket mold. Old recipe – something totally new and pretty! In a medium-sized pot, cook onions, celery, and carrots (mirepoix) with the diced potatoes on medium-low heat so that the vegetables “sweat” for about 5-8 minutes, until the onions are translucent. Add in the garlic, fennel, and chili flakes, and continue to cook for about another 5 minutes. Turn the heat up to medium. Drop in the tomatoes and mash them up roughly, mixing them in with the rest of the vegetables. Add in the stock and bring to a boil on medium-high heat, then add in the kale. It’ll look like a lot, but it’ll cook down quickly (much like spinach). Once the kale is wilted, put the lid on the pot and let the soup simmer for about 10-15 minutes. Add in the beans and cook for another few minutes before serving. 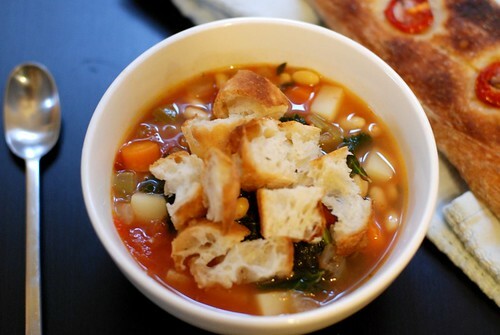 Serve with bread pieces, a glug of olive oil drizzled on top, and freshly grated parmesan sprinkled on top. For the homemade bread, I used the recipe as posted here, but shaped them into thin strips with cherry tomatoes or crushed garlic cloves pressed into the loaves (the recipe makes about 4). When pressing the sliced cherry tomatoes in, Jim Lahey’s recipe also called for a thin slice of garlic on top of each tomato, with a little bit of thyme leaves on each one. 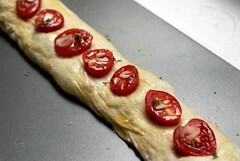 Don’t be afraid to push the tomatoes in – the dough should’ve risen to the point where it doesn’t bounce back when poked. Then brush with olive oil so that everything is coated thinly, and sprinkle with coarse sea salt to finish off. Bake uncovered at 475 degrees Fahrenheit for about 20-25 minutes until golden. *Apologies for using a 1/2 tin – I suppose you could use the whole tin, but I prefer a lighter tomato soup.